April Kennedy...My Life + My Style: CRAZY CRAFT LEADERS! One of our crafts at camp was a Paperbag Camp Yearbook. We let the girls each take turns taking a photo booth style picture with 4 different poses to put on the front of their Yearbook. Girls had so much fun making these books and then passing them around for friends to sign. Here is our photo booth example. The craft ladies being silly...me and Carla! Love you girlie. You are amazing. What fun it must have been for those girls. Look at you two sassy, crafty ladies! 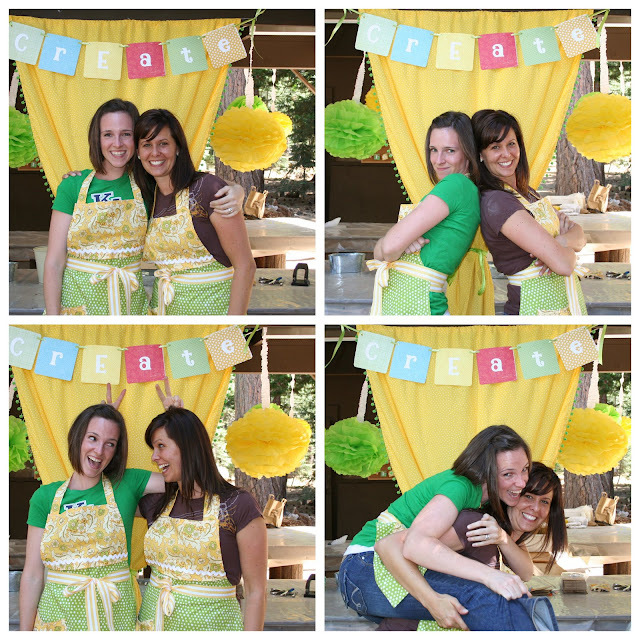 The aprons you made (and everything else too) look so cute! I bet you guys had a blast together! I didn't know you did a photo booth! That is such a great idea! I already thought it was the cutest craft studio ever...with the two cutest craft studio girlies ever. Shannon and I wanted to go to the photo booth and make our little yearbooks, but it just never happened. Such a cute idea!